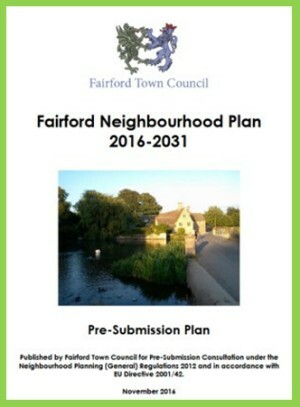 There was a consultation on the latest ideas for the Fairford Neighbourhood Plan at Fairford Community Centre between 10am and 8pm on Thursday 14th March. You can view the documents for this consultation. In November the FNP Steering Group received the final report from our consultants, Water Resource Associates, on "Groundwater Monitoring and Review of Flood Risk at Fairford". This report evaluates the risk of flooding at all the potential development sites in Fairford. Based on this and their own site investigations, our other consultants, AECOM, are now due to produce a final site assessment report early in February 2019. In the meantime the Steering Group have been redrafting policies based on the objectives of the Plan. The Steering Group is also preparing a list of questions for Cotswold District Council so that the Neighbourhood Plan is aligned to the Local Plan. The Steering Group are also liaising with other local interest groups to ensure that the policies in the Plan are in line with their needs. A preliminary drop-in public consultation is now planned for Thursday 14th March (daytime and evening sessions). In the spring there will be full public consultation when all documents will be available to view online. Why do we need a Neighbourhood Plan for Fairford? We cannot change the past but we can, and must, plan for the future. A Neighbourhood Plan is not just about future housing, but will also look at what needs to be done for employment and business growth, roads, drainage, schools, healthcare and other facilities for ALL the community, up until 2040. The plan must be community driven, and represent the views and wishes of YOU, the residents of Fairford. Through this, YOU will be able to influence the future of Fairford. This Neighbourhood Plan, when agreed, will have legal force, so the Planning authority (and Planning Inspectorate) will have to take notice of it. Click here for what is involved in a Neighbourhood Plan. Funding is provided by grants. The purpose of Fairford's Neighbourhood Plan is to ensure that Fairford's continued development is sustainable, meets the needs and wishes of both existing and future residents and is in keeping with its character as a small historic Cotswold market town.